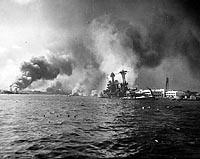 USS California (BB-44), flagship of the Battle Force, was hit forward and aft by two Japanese torpedoes in the early minutes of the Pearl Harbor raid. She was later hit by a bomb and near-missed by another, which caused additional flooding. Though her design included very good protection against underwater damage, California's actual condition was much less satisfactory, with many watertight compartments open and some design details proving unable to resist the effects of torpedo warheads. 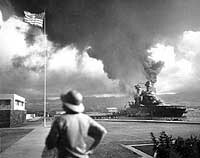 California had steam up and was nearly ready to get underway when a large mass of burning oil, drifting down "Battleship Row", threatened to set the ship afire. She was ordered abandoned, and, when the crew returned on board sometime later, it was impossible to control her flooding. 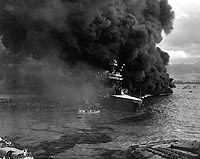 Despite strenuous efforts, she slowly settled to the bottom of Pearl Harbor, coming to rest on 10 December. The battleship was raised in March 1942 and received repairs and modernization work that lasted until January 1944, over two years after she was sunk. 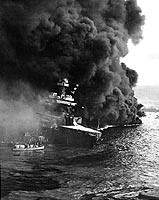 Nearly a hundred of her officers and men were killed in action during the Pearl Harbor attack. 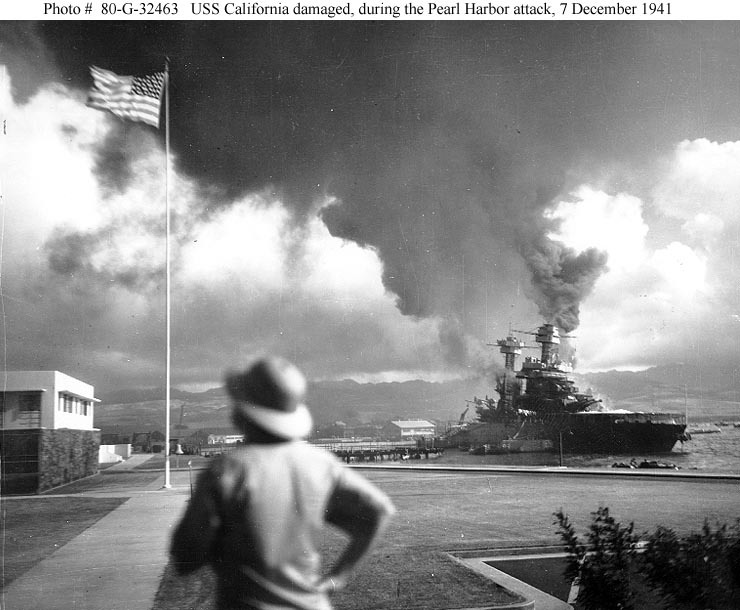 This page features views of USS California on 7 December 1941 and during the following days. Machinist's Mate First Class Robert R. Scott. 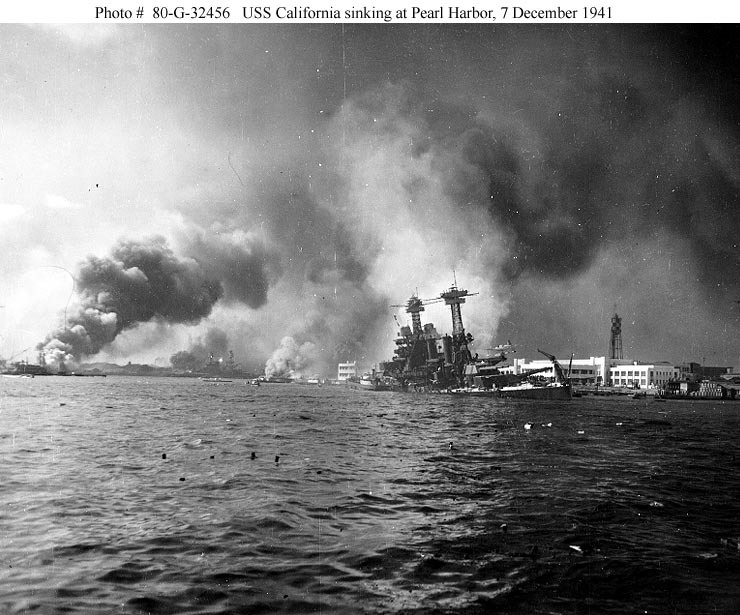 Scene on the southeastern part of Ford Island, looking northeasterly, with USS California (BB-44) in right center, listing to port after being hit by Japanese aerial torpedoes and bombs. 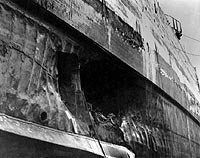 Torpedo damage to the hull of USS California (BB-44), photographed at the Pearl Harbor Navy Yard in April 1942, soon after the ship had been drydocked for repairs. 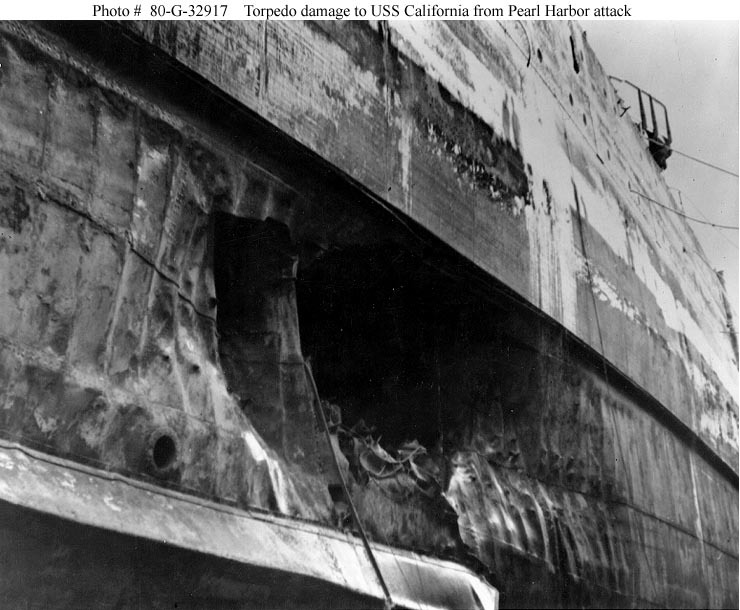 This is California's forward torpedo hole, centered at about Frame 52. Note armor belt at the top of the hole and bilge keel below it. 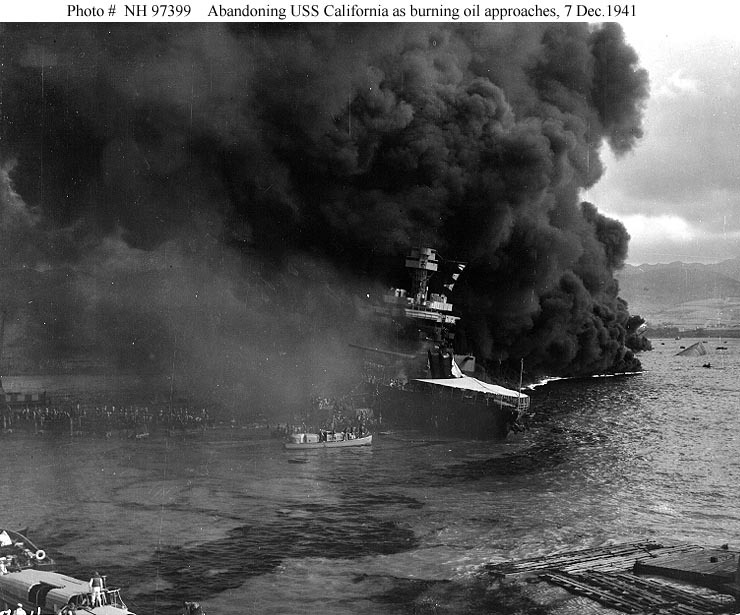 Crew abandoning the damaged USS California (BB-44) as burning oil drifts down on the ship, at about 1000 hrs on the morning of 7 December 1941, shortly after the end of the Japanese raid. 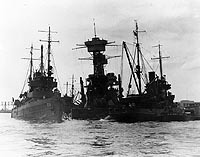 The capsized hull of USS Oklahoma (BB-37) is visible at the right. An Officers' Motor Boat is at left. This view is cropped from Photo # NH 97399. 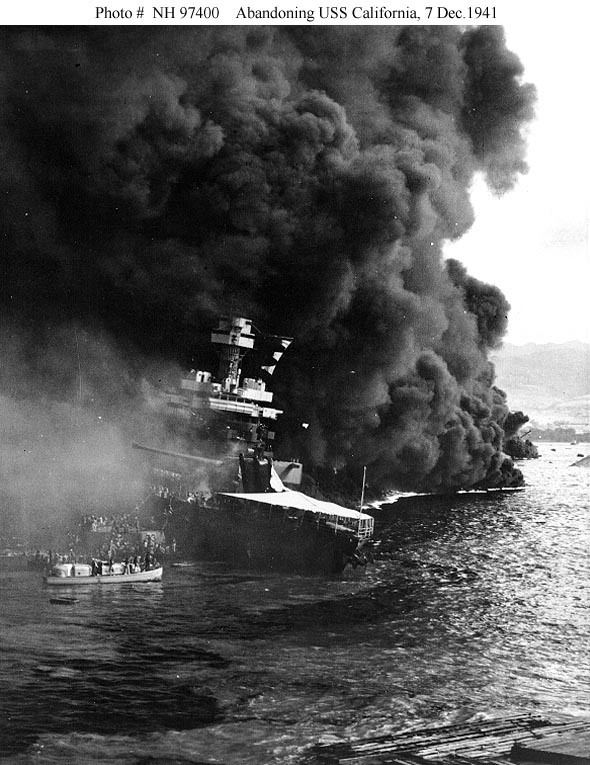 USS California (BB-44) slowly sinking alongside Ford Island as a result of bomb and torpedo damage, 7 December 1941. USS Shaw (DD-373) is burning in the floating dry dock YFD-2 in the left distance. 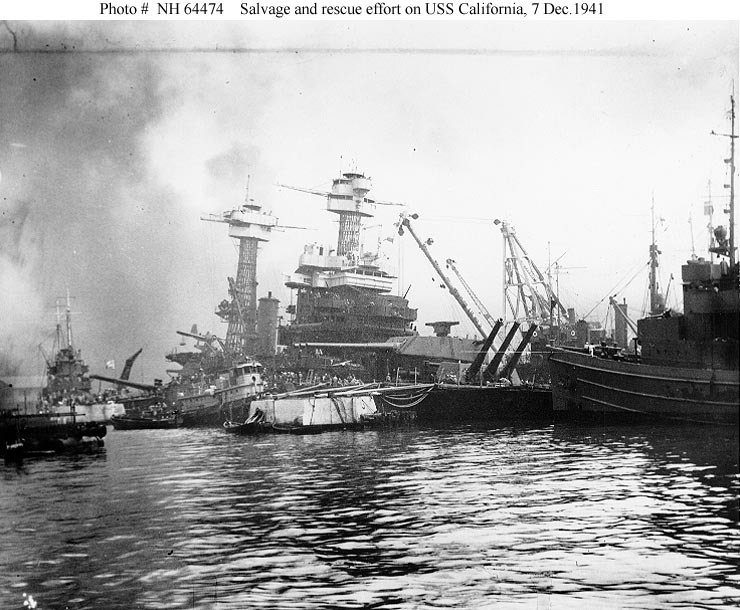 USS Nevada (BB-36) is beached in the left-center distance. 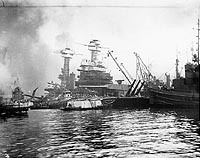 Tugs and other ships trying to keep USS California (BB-44) afloat, soon after the Japanese torpedoed and bombed her at Pearl Harbor, 7 December 1941. View of USS California (BB-44), taken a day or two after the Japanese raid. 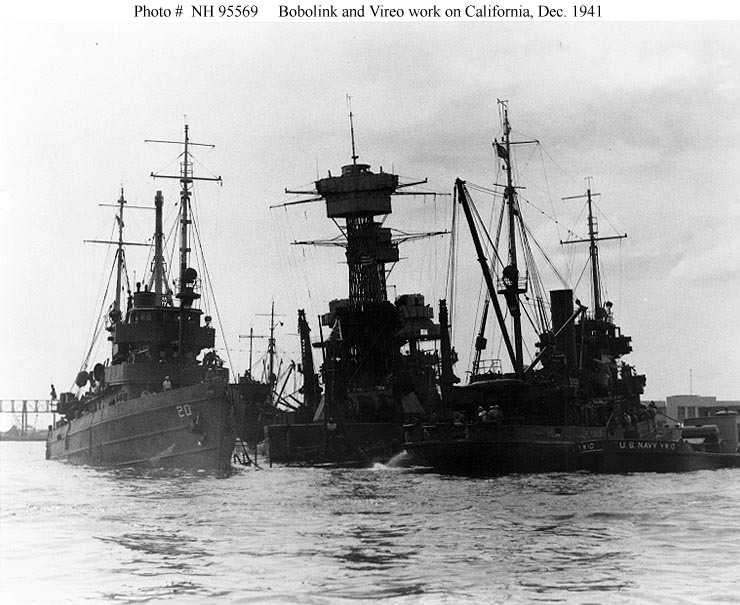 USS Bobolink (AM-20), at left, USS Vireo (AM-52) and YW-10 are off the battleship's stern, assisting with efforts to keep her afloat. Collection of Vice Admiral Homer N. Wallin, USN(Retired), 1975.